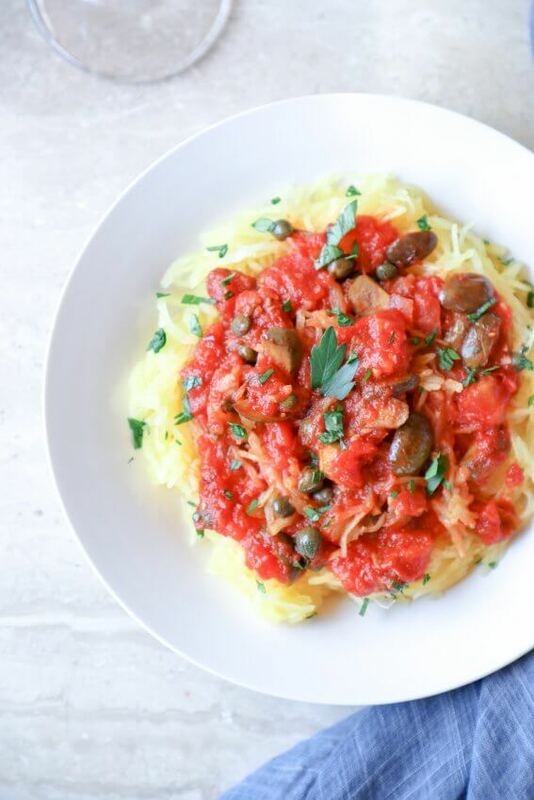 This keto spaghetti squash puttanesca is rich, and tangy, and ultra satisfying! It’s also very easy to throw together at a moment’s notice with items you probably already have in your pantry! 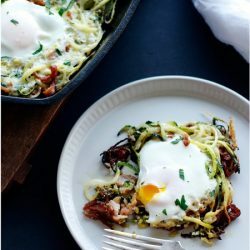 Not a fan of spaghetti squash? 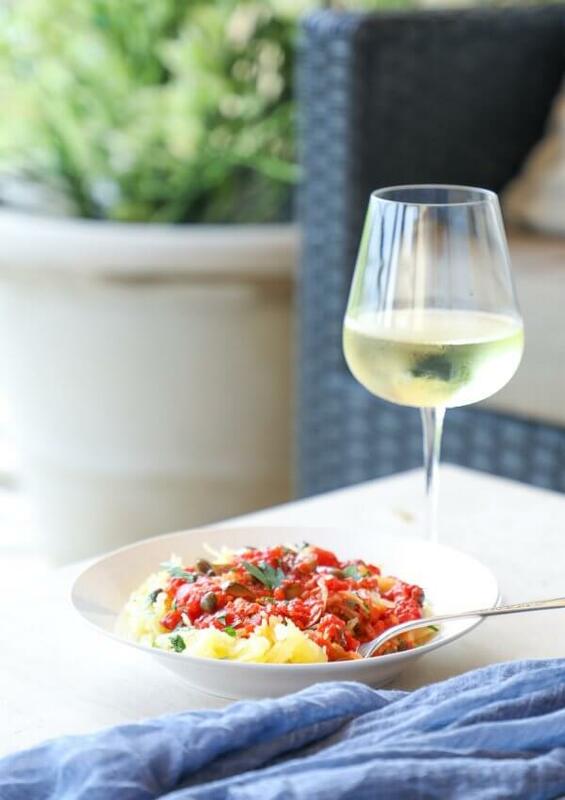 This keto puttanesca sauce can easily be served over zucchini noodles instead! 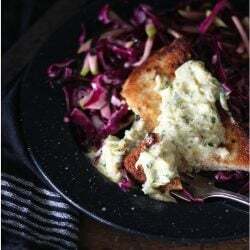 I’ve been working on more dairy free recipes to post here on IBIH for those of you that are lactose challenged or just looking to clean up your keto eating. It’s not always easy to get hearty and satisfying keto meals when you’re skipping the cheese and cream – believe me! 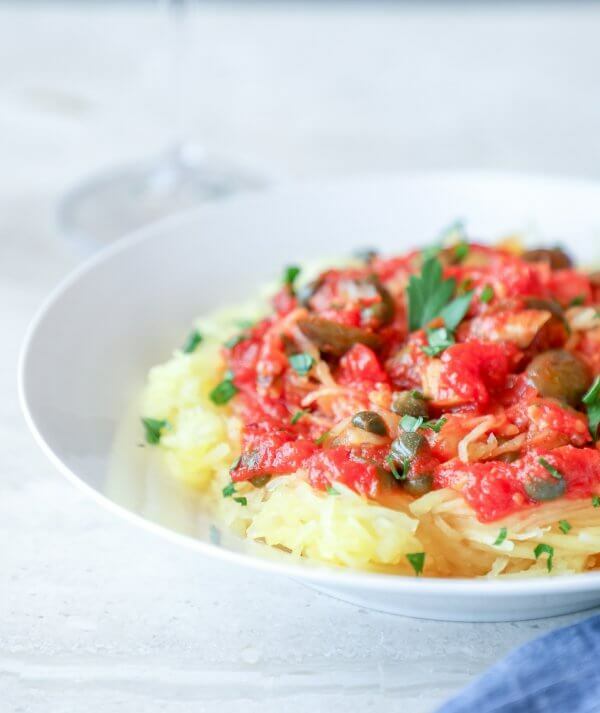 This keto spaghetti squash puttanesca is definitely not short on bold flavors or textures though – so much so that I highly doubt that you’ll miss the dairy. That being said, if dairy isn’t an issue for you, then loading this keto puttanesca up with some good quality Parmesan or Romano cheese before serving will make it even better! The bright, briny flavors in a classic Puttanesca sauce come primarily from the olives and capers that are added to the tomato sauce. It also gets a complex earthy vibe from the anchovy paste – which doesn’t make the sauce taste like fish, I promise! You can leave it out if you like, but it’s going to taste better with it in there, trust me! 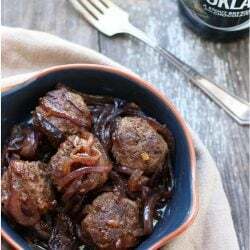 If you’re vegetarian and prefer to leave it out, then I recommend throwing in a few extra capers or olives to make up the difference in flavor. I used Greek green olives that I brought back from Santorini, and capers that my friend’s dad in Italy gave us from his own garden for this keto spaghetti squash puttanesca. That first bite transported me instantly (sadly only in my mind) back to our recent trip to Europe. 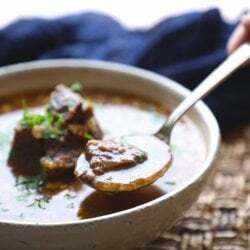 My hope is that you will make and taste this keto puttanesca and also feel like you’re sitting down to dinner in the mediterranean. At the very least, it will be an easy and super tasty healthy keto dinner. Throw in a glass of decent red or white wine, and it’s a party just waiting to happen. 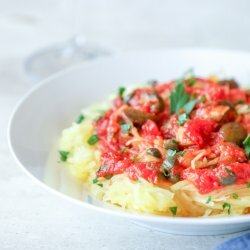 The natural sweetness of the spaghetti squash pairs really nicely with the keto puttanesca sauce, but if you can’t get it, don’t like it, or want to reduce the carbs by a few grams per serving, you can absolutely serve this keto puttanesca with zoodles or even over rinsed shiritake noodles if you want a more authentic pasta texture. 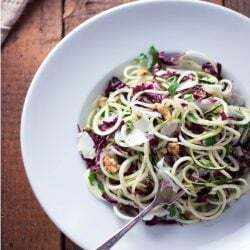 Since the keto puttanesca sauce is the star of this dish and is what brings most of the flavor – you can pair it with a variety of keto “pasta” options with excellent results! This keto spaghetti squash puttanesca is a tangy, tasty, and easy low carb, dairy free, Whole 30, gluten free & Atkins friendly Italian dinner recipe! Add the garlic, capers, anchovy paste and olives and cook for 2 minutes, or until fragrant. Add the tomatoes and red pepper flakes. 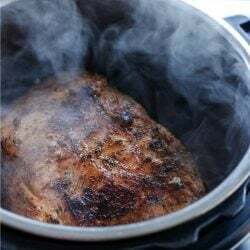 Simmer 5 minutes. Stir in cooked spaghetti squash. 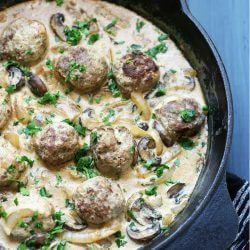 Serve immediately garnished with fresh parsley. Just served this with Palmini and it was epic! Looks delicious! I was wondering if you could just let it simmer in a crock pot on low for several hours? I was thinking of doubling it in a crock pot and then freezing single servings. I imagine it would freeze well. Any thoughts on cooking it in a crock pot and freezing the sauce? Thanks! 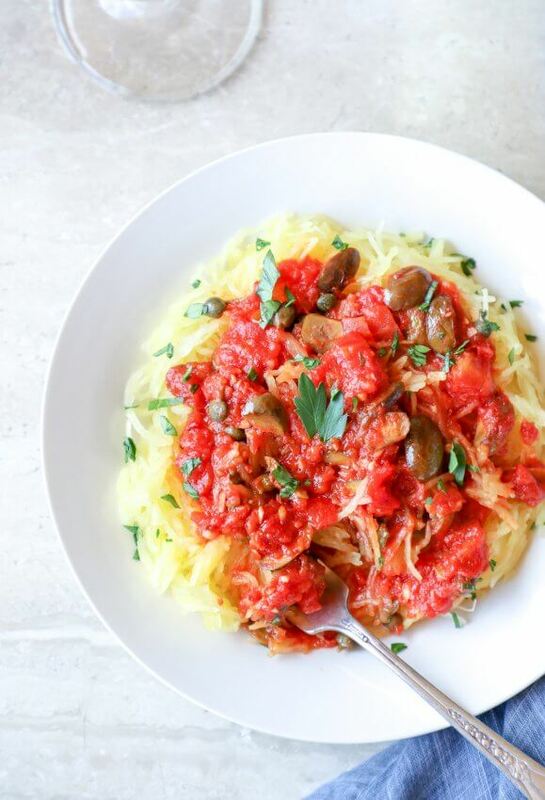 So love spaghetti squash! I had it with and without cheese and it is delicious either way. Recently gave up dairy so this is great. I made this last week! SOO good! I really enjoy your recipes! I plan on trying the brisket tomorrow! Thank you! Your total carbs says 118. I think you mean 11. 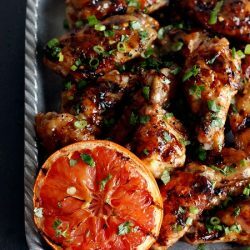 This recipe looks easy and flavorful. I have fresh tomatoes to finish up and this looks like just the thing! Thanks for catching that error Corrie! Hope you like it!